Breaking down the best, worst, and most realistic scenario for Michigan's 2018 season. Editors note: I've been far too absent from these pages this offseason. I could go into reasons like real life, work, family, etc. Those are valid. I've also been a little bitter about how last season ended. All of those things combined are why this blog has been virtually silent since January. This blog has been a true labor of love for me these last 11 years. I WANT to spend more time on it, but from time to time, I need to pull it back and focus on the things that drive my career and actually put food on the table. I fully intend to focus more time here as the season draws closer...as season which I believe could be quite memorable which I'll get into a bit in this post. Basically, I just want to say thanks so much for coming here and reading this. Let's bring on 2018! Fall camp hasn't even commenced yet but that isn't going to stop us, or anyone else really, from putting their predictions out there for 2018. I'm not going to sugar-coat it, Michigan has a very tough slate...probably the toughest schedule in the country. If 2018 is going to be the year that Jim Harbaugh and Michigan bring a Big Ten title back to Ann Arbor, a lot of things are going to have to go their way, including some lucky breaks that Michigan isn't used to getting in recent years. Normally, with Jim Harbaugh at the helm, I'd say the best case scenario would be an undefeated season and a national championship. I said that last year and with the way the season ultimately played out...I think a best case for 2017 shouldn't have been 15-0...not at all. Too many question marks on offense, especially with the OL and receiver units. It's also worth noting that coaching friction on the offensive side truly hindered last years' squad, which no one really knew about prior to the season. For 2018, Michigan brings back many key contributors and even adds a few such as Shea Patterson and Tarik Black who's back from injury. Word on the street is that Grant Newsome could be in the mix for playing time along the OL, but that's very much in question still. A much needed shake up of the offensive coaching staff should help things out tremendously. IF, and that's a big if, everyone can stay healthy, especially on offense, Michigan has all of the tools they need to be a playoff team this season. I won't say they'll go undefeated because even with this schedule that just seems like a stretch...I mean, seriously, if Michigan goes undefeated it could be one of the most impressive CFB seasons by any team in a very long time. But at least one loss is likely even in the best case scenario. It could be Notre Dame, Penn State, Wisconsin, Michigan State, Ohio State...all are big time games. But given how the CFB playoff has played out the last few years, losing early or even late (just ask Alabama) isn't a death sentence. If all goes well and Michigan can shake off a loss to say Notre Dame or Ohio State (and things play out to allow Michigan to go to Indy), a best-case scenario has Michigan bringing home the B1G trophy and making the CFB playoff. From there is a crap shoot. But either way, Michigan making the playoff would be widely regarded as a successful season despite a loss to a rival. Ugh. Last year I said a worst case would be 4 losses, which is essentially what happened plus the bowl game which was an epic collapse. For 2018, I think the worst case could be even worse, unfortunately. The schedule is just far too daunting. And as we sit here in July thinking back on how last year ended, it doesn't exactly fill me with confidence that this offense could be suddenly good enough to be the offense we need them to be to navigate this gauntlet. Defensively, Michigan is poised for another record-breaking season. They simply have too many playmakers not to be terrific regardless of what the offense can or can't do. But they were great last year and still couldn't offset the woes of the offense. With this schedule, my worst case would be 6 losses. Notre Dame, Wisconsin, Michigan State, Penn State and Ohio State plus a random loss to someone like Nebraska or Indiana. I mean if the wheels are going to fall off...they are going to fall off hard (kind of like losing to South Carolina). The key to doing a post like this, before fall camp has even started, is to try and decipher where Michigan sits right now in the Big Ten landscape. This league, the east division specifically, is pretty damn tough. I have no doubt Michigan can be THAT team this year, but it's going to take a championship effort week-in and week-out. With this schedule, there are no off weeks. The 2018 season will be just as tough mentally as it will be physically. Michigan must get stronger as a team in order to compete...something Jim Harbaugh mentioned in the post-game presser after the loss to Ohio State last year. But they also need to get tougher mentally...than that comes from senior leadership. 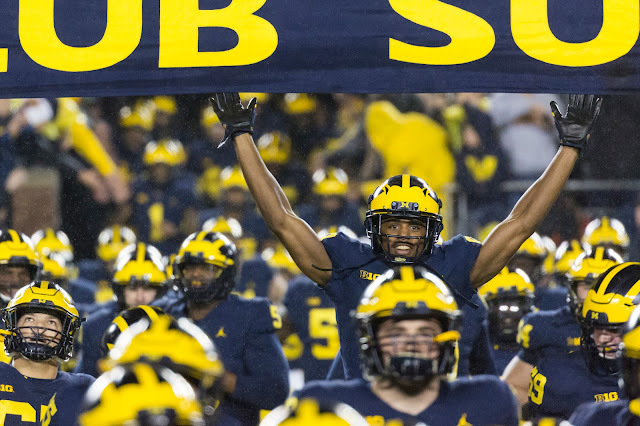 Guys like Karan Higdon, Juwann Bushell-Beatty, Chase Winovich, and yes even Grant Newsome, need to step up and take ownership of this team. Every successful Michigan team throughout the years has always been able to rely on strong leadership. Michigan might have that this season...either way, they're going to need it. I envision a realistic scenario where Michigan is truly a upper-crust team...worthy of making the playoff but could run into a few bounces that don't go their way. I mean, this is football, not everything is going to go your way...but it's about how you react as a team and push forward that will determine a best-case or worst-case scenario. I can see winning a couple of those tough road games in South Bend or East Lansing or Columbus...but probably not winning them all. The key will be injuries and IF Michigan can get the offense going...more specifically the running game. Michigan will not contend for any championships in 2018 if they can't run the ball effectively. I can't make it any simpler than that. I feel like there's a certain "sink or swim" aspect to the 2018 Wolverines. It's either going to click or it's not. If it clicks and Michigan gets a few lucky breaks...then the ceiling on this squad is unlimited. But if you run into games like the 2015 Michigan State game or the 2016 Ohio State game...games where bad luck just finds a way to get the better of you...then a 2 or 3 loss season is likely. Michigan must not let 1 loss turn into 2 or 3 or 4...which is highly probable with a schedule like this. If they can bounce back from what is certain to be a close loss if there is one...then there's no limit to how successful 2018 can be.